In case it’s not immediately apparent, I’m left-handed. 1. 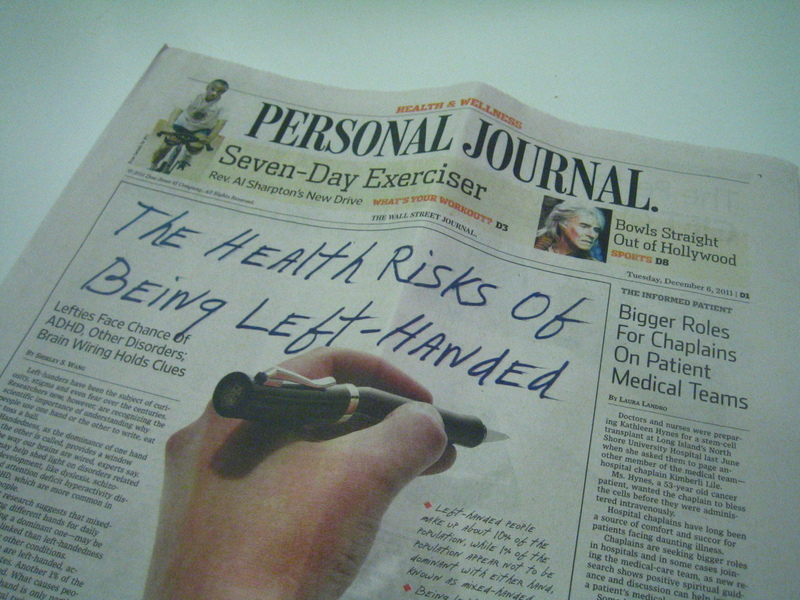 Left-handed people are more prone to neurological disorders, such as schizophrenia and ADHD. 2. Left-handed people earn about 10% less than right-handed people. 3. Left-handed people are more apt to have greater divergent aptitude (ie, creativity.). 4. Left-handed people don’t necessarily die younger than those who are right-handed. So what am I taking away from this? Well, maybe it explains why I was a theatre major. Also, my crazy is legitimate. And you’d better believe I’m going to reference this article every time I forget to do something at work or have a PMS flare up. And now we know that I’ll be around for a looong time to do it. So thanks, Wall Street Journal! journalism is really riveting these days, isn’t it? Note to self: never sit to the left of you if/when we ever go out to dinner together. I dunno Megan… there’s still a lot of crazy in there to be accounted for. I’ve always, for no reason, wished I was left handed. Ha- I’m left handed too– all the best people are, and maybe the crazy just makes us more interesting! BAHAHAHA- that is awesome! I wish I had an excuse. Unfortunately, I’m just crazy.